You may have trouble getting approved for a new credit card when you’re trying to repair your credit. It creates a dilemma since you need to add new positive information to your credit report. Fortunately, there’s a product that can help you. A secured credit card is a type of credit card that requires you to make a security deposit against the credit limit. Other than the security deposit, the secured credit card acts like a regular credit card. If you make your payments on time for several months, you can get your security deposit back. When you choose a secured credit card, there are several features you should consider. Does the credit card report to the three major credit bureaus? When it comes to secured credit cards, this is one of the most important things to consider. Any credit card you choose for credit repair must report to the major credit bureaus – at least one of them. Otherwise, your timely payments aren’t doing anything to help your credit history. The major credit bureaus are Equifax, Experian, and TransUnion. There are other credit bureaus out there, but they’re not the major ones that most lenders consider when they’re calculating your credit score. A certain number of fees are expected with a secured credit card, but these fees shouldn’t be excessive. An annual fee is the only reasonable fee to pay for a secured credit card and that fee should be less than $40 per year. Watch out for high upfront processing fees that take away from your security deposit or create a credit card balance before you ever make a charge on the credit card. Other outrageous fees include high monthly maintenance fees and credit limit increase fees. 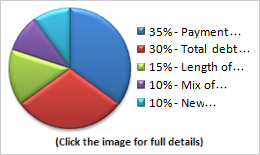 How much of your deposit goes toward the credit limit? Ideally, 100% of your security deposit will go toward your credit limit. So, if you make a $1,000 security deposit, you’ll get a $1,000 credit limit. Beware of credit cards that don’t give you full credit for your security deposit. There are plenty of secured credit cards that give you a credit limit equal to your security deposit, so keep looking until you find one. Secured credit cards don’t have the most competitive interest rates since they’re aimed at people who are a credit risk. But, there are still some secured credit cards with decent interest rates. Interest rate shouldn’t be a big factor with a secured credit card and here’s why. To rebuild your credit and avoid creating debt, you need to avoid carrying a balance on your credit card. To do that, you’ll need to pay your balance in full every month. That means you won’t be paying any interest. Does the credit card convert to an unsecured credit card? The best secured credit cards will convert to an unsecured credit card after 12 to 18 months of on time payments. Even if you end up with a credit card that doesn’t convert, you may qualify for an unsecured credit card after a year of making timely payments and maintaining a low balance.